In the world of digital marketing, email marketing has always been in a constant state of flux – updating and constantly changing and a modern marketer very clearly knows it. With high volumes of data, technology, and insightsimpacting our digital strategies, everything from the tools we use to conduct business to the ways we communicate information to our target audiences – our email marketing plans have evolved. Email marketing has been one such platform which has been rapidly growing in this industry. 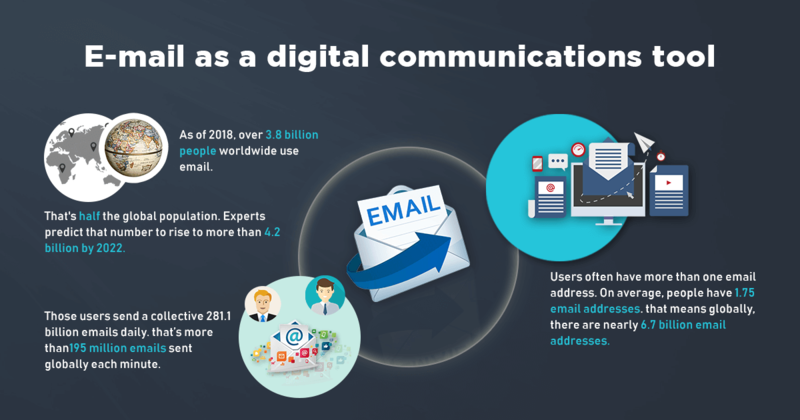 According to a research approximately 2.9 billion people globally are using email as a digital communications tool. Thus, it’s clear that the future is a ‘moving target’ and can only be achieved through something which is at ‘electronic’ speed – which in this case is email. Let’s check out some insights on the upcoming email marketing trends which promisesa high ROI earning for all businesses at all levels i.e. from startups to large scale enterprises. Email marketing world has witnessed an increase of focus on legal regulation. With the upcoming General Data Protection Regulation (GDPR) and worry of penalties, marketers are in a state of uncontrolled thrill. This regulation is being created to protect consumers and help marketers to stay within the regulatory law limits. The measure has been taken to improve brand perceptions and ethical marketers have agreed to this positively. Marketers needed data to make sure emails are welcomed in the inbox. Customers wanted an enhanced, but safe online experience. Almost 2 million cyber frauds incidents a year in the UK alone clearly depicts the amount by which the consumer’s education has been lagging behind when it comes to internet and email. However, individual companies have now started running campaigns to educate their very own customers to increase cyber literacy. In the running up towards GDPR coming into force, consumers will be more exposed to headlines, re-engagement campaigns and items popping up in social feeds. This will also witness an increase in the awareness of rights and obligations. The customers and subscribers will thus know more, ask more, demand more and expect more. Automation means introducing systems that will generate actions due to certain triggers that you set up. Applying marketing automation to email marketing simply means that you can set up the email once and then as more people continue to meet the trigger you defined, emails will continue to be sent to them without you worrying anymore. It essentially ‘automates’ your email marketing system for you. Marketing automation will grow significantly in 2019. It’s this new low-cost and easy-to-integrate technology that will enter the market and will use marketers’ capabilities and the available technology to help them grow. The need of marketing automation for businesses is to offer more guidance and to support the brand throughout their growth. However the customer’s journey is increasingly complex and with so many touch points, email is becoming more thoroughly integrated with different channels. Due to a win-win situation, improving both efficiencies and the effectiveness, automation is also being increasingly adopted by smaller retailers who are looking forward to maximize their revenue from the channel and compete with the bigger players who are already embracing it. and images, to predicting how a potential lead will interact with an email, to find ways on how to make it more personal and to estimate when a viewer may want to unsubscribe from an email list. AI for marketing automation is on a continuous growing demand, to the point where global automated email marketing alone is expected to account for $USD 2.7 billion by 2025 which is just six years away. 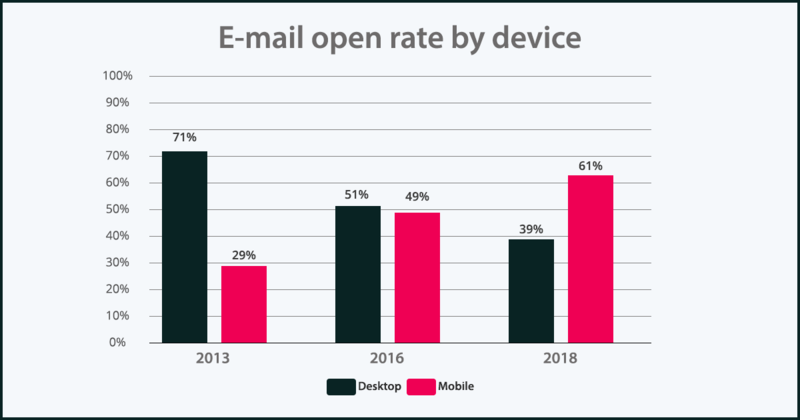 With the open rate on mobile devices consistently hovering above 50%, it’s no surprise that subject lines are getting shorter. Studies claim that subject line character counts that hover between 1 – 20 characters have a higher open rate, click rate and click-to-open rate. Emojis still continue to grab the attention of the recipient. Studies show inconclusive results, but inboxes filled with Black Friday and Cyber Monday emails, shows that marketers love using them. They’re easy to use, they help keep character counts low while keeping them informal and conversational. Speaking of conversational tone, email subject lines are getting increasingly casual with time. The use of conversational language, humor and puns will surely be a hit in 2019, as marketers are now welcoming less formality in their brand image. Lastly, email subject line testing is the most common type of email test because it is comparatively easier to create several versions without having to touch HTML assets. What used to be a test that marketers would have to plan in advance, will become a fluid and dynamic process that self-optimizes across all send using intelligence technologies like Persado, Phraseeor even ESP/marketing cloud AI testing capabilities. To get the best results simply follow and test this golden checklist. Test extreme lengths – ReturnPath data says 17% of subject lines between 61 – 70 characters in length perform the best. Test CTA’s – Drive action rather than catching attention by including a strong call-to-action. Test questions – This makes your subject line look interesting and different. Also, helps you to explore new ways to promote your content. Be personalized – Using the 1st name is common now. Try experimenting with surnames, recent purchases or locations including a city name. Take inspirations – Taking inspirations from various situations could besimply easy. Be emoji friendly – It’s a useful tool that can help you to test the subject lines effectively and strategically. Testing the tone – While not disrupting the brand voice or guidelines, there is still a lot of scope for you to test the tonality of the email. As of 2019, interactive content will continue to rise. Emails which contain games, quizzes, image carousels or simply ‘fun content’ will allow users to interact with the brand while staying inside the email itself. This is being practiced by more and more brands to allow subscribers to engage within emails in new ways – a personality quiz or the ability to book hotels without leaving the email. The more engaged and ready to purchase, a subscriber is, more will be their brand loyalty. The use of interactive content will also help in boosting sales or it can simply educate and entertain. Fun games are a great way to get your customers into the habit of opening your emails. Inbuilt purchases within the email, makes the conversion and buying process even easier and faster. This trend will definitely boost sales forbrands whoembrace creativity in their messages. Microsites too are going to be a rage in the near future. These types of interactive emails allow the subscriber to actually interact with the email interface without having to click on a different link. These emails can feature videos, integrated surveys, social sharing, menu options and so much more. These ‘microsites’ help to keep the email recipient engaged for longer than ever and helps to retain more customers than the simple and monotonous emails. These emails deliver all that is needed by the customers to see, know and purchase right in the inbox, without having to leave the email. We can also take cues from social media platforms and design good graphics that will make an impact to your audience. Personalizing email messages will also help your company shine and incorporate interactive content such as videos, pictures, animated gif’s and more. It is basically a technique that uses the past and current data to predict future outcomes and trends and it is one of the most talked about trends in the industry, as it helps predicting how consumers and customers behave. This predictive system can be used to keep you a step ahead of what your consumers will do, try predict the lifetime value of a customer, and more. While measuring results, it is arguably more important to try and predict what strategies will work and what will not. Predictive analytics is by far the best way to level up your email marketing! Even Facebook & Twitter combined, email marketing is solely 40% more effective to acquire customers. Investing more time and effort to deliver the best email marketing is a-must if you want to remain in the race. Acquisition / Activation – The sole purpose of all these hard work and effort is only one – generating more sales. The analytics system helps online sellers bifurcate their customers into small groups and build models based on learning from them. The data derived from predictive analytics is helpful in segregating that, what email is best for which group. It is the key to make the wishes of your customers come true. It helps in creating personalized emails and uses your subscriber list to generate more sales. The more you personalize the email the better it is for your business because you need to send emails to remind them of your store and products and not to spam them. Retention / Reactivation – Customer retention is one of the most important aspect and a simpler way to do so is to reward your frequent ones. Send them a thank-you email to show your gratification and how you appreciate their support or send your loyal ones a special gift as a token of their loyalty. Your customers now have the reason to stay longer at your store while you have more time to build stronger relationship with them. Predictive analytics has made micro segmentation cheaper, less labor-intensive and dynamic and due to this real-time personalization has become more accessible for small marketing teams. Marketers are writing higher converting emails and subject lines guided by AI and being helped by machine learning. In addition, predictive email marketing have also helped marketers reduce churning by identifying which contacts are most likely to unsubscribe and opt out. Dutifully sponsored by all the General Data Protection Regulation (GDPR) chaos, digital marketing industry has witnessed consumers regain control over their personal data and companies had to adhere to these new rules to ensure compliance with the new European regulation. Data protection will continue to be one of the most talked about email marketing trends even in 2019, as brands continue to work on providing the level of privacy and security as demanded by their customers. The new set of rules will completely transform the way companies used to target their users online, as it will allow their users to choose whether they want to accept the website cookies or not. With ePrivacy, marketers will now have to look new means of procuring data, which will have an impact on the channels used. According to a recent study 30% plan to reduce the amount of cookie-based display. Email marketing may be one of the oldest forms of digital marketing but that definitely does not make it an obsolete method. Recently the entire web space watched email marketing turn 40, while many claimed that it’s the end time for this, many still believed that it will make a great comeback. Now, as we ring in to the new year with latest trends such as artificial intelligence (AI) for personalization, interactive content and a lot more, we should be ready to see a whole new set of email marketing trends. Here we’ve tried to cover the most promising email marketing trends that are projected for the market. What do you think could be the next breakthrough email marketing trend we have missed? Do share your views and feel free to contact us at contact@epikso.com or book an appointment to get in touch with our subject matter experts.